Soak the cut up potato in cold water for 10-15 minutes. Drain and pat dry. Meanwhile, bring a heavy, tall sided pan* of oil up to 300. Add the fries in a fry basket if possible) and cook for about 6 minutes. They should look pale but when broken in half, they should look nearly cooked inside. Drain and allow to cool completely. Heat the oil again, this time to 350. Cook fries about 3 minutes or until golden and crisp. Drain and serve immediately. *I used this Swiss Diamond saute pan and it worked well, we were able to make all of the fries in only two batches and they browned evenly. 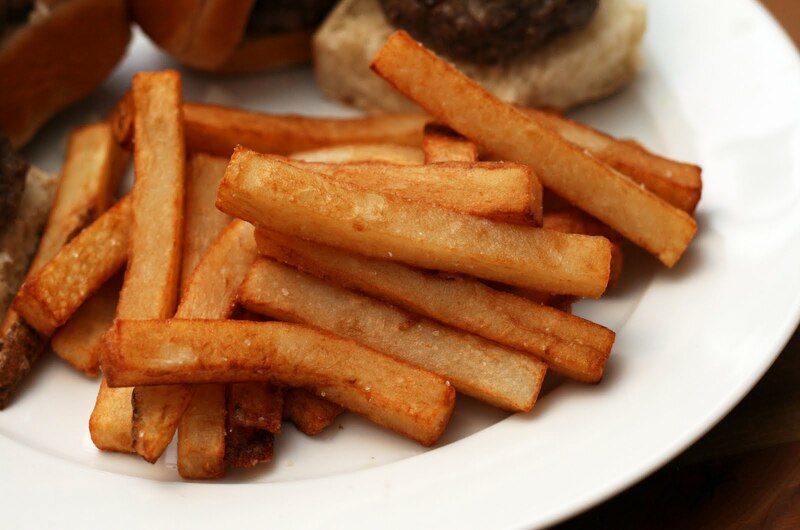 Doughboys brought back a love of French fries from WWI and by the 1920s they were found on menus all across the US. A favorite at early fast food restaurants employing comely carhops, they have only increased in popularity over the years. Who can imagine an America without French fries? Double frying is a bit tiresome but honestly, I haven't found a better way to make a crisper fry at home. Don't be tempted to skip this step! Note: I sliced my potatoes using a vegetable cutter/French fry slicer. It produces more uniform slices than I can do by hand. I just cut the potatoes to fit and then sliced.